TP-Link reveals the AV200 Mini Powerline Adapter Starter Kit, which transforms any power socket into an Internet outlet with transfer speeds of up to 200Mbps on a line length of up to 300 meters. TP-LINK, a global provider of networking products, today announced its new AV200 Mini Powerline Adapter Starter Kit, enabling users to instantly create a secure, high-speed network in the home or office using existing electrical wiring. In transforming any power socket into an Internet outlet, experiencing reliable and fast connections to devices such as gaming consoles, Blu-ray players, and DVRs just got that much easier. With high-speed data transfer rates of up to 200Mbps on a line length of up to 300 meters, this Mini Powerline Adapter Starter Kit is an affordable option allowing users to enjoy HD video streaming, online gaming, VoIP or any other bandwidth intensive applications from the home or office. At just over 1” thin, the AV200 Mini Powerline Adapter Starter Kit showcases a new ultra-compact design. Further, its high quality, elegant white shell helps it nearly blend completely into the wall and power outlet. The sophisticated Power-Saving Mode on the AV200 Mini Powerline Adapter Starter Kit consumes less power when compared with existing Powerline adapters. When there is no data transmission or reception occurring over a certain period of time, the adapters will automatically switch from their regular "Working" mode to "Power-Saving" mode, lowering energy consumption by up to 35 percent. 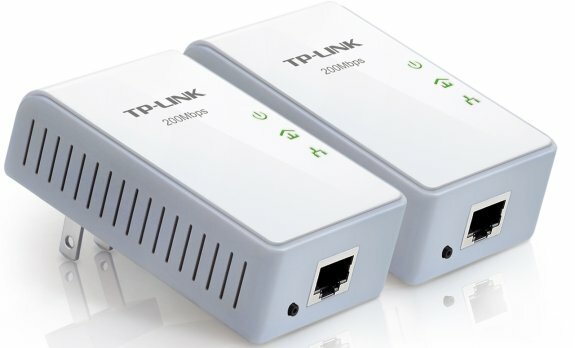 It also comes with a pair button on each adapter so users can easily set up a hassle-free connection with 128-bit AES encryption for network security and data protection.